Your back teeth are the most susceptible to decay, as they are the ones you use for chewing. Your dentist can protect your molars and premolars by coating them with a plastic substance called sealant. The color of dental sealant varies based on type: some are clear, others are white and there are some sealants that are slightly tinted. Your molars and premolars have grooves on their chewing surface called fissures which trap food and other matter. These grooves can be quite narrow, making it difficult for toothbrush bristles to reach within them. They can also be quite deep and thus hard to clean. As plaque continues to accumulate in these grooves, bacterial action intensifies, attacking tooth enamel and eventually causing cavities. Though you can use fluoride toothpaste to prevent decay, your molars and premolars need extra protection. Sealing will provide this protection by smoothing out the surface over the grooves, making it easier to clean. When the surface of the first permanent molar erupts above the gum, its fissures can be sealed. This will prevent tooth decay in small children. By age thirteen, most children will have erupted their chewing teeth and as these teeth erupt, they should be sealed to provide extra protection. Wisdom teeth erupt late in life and unless they are extracted, they too can be sealed. Note that sealing should not give you or your child a way out of practicing good oral hygiene. Other areas of the teeth can also decay if you don’t brush them. You can also get gum disease if you don’t take care of your teeth and mouth. Because sealants are supposed to offer protection, they are only placed on the surface used for chewing. Other permanent teeth can also be sealed if they have grooves. In babies, it’s sometimes necessary to seal some of their baby teeth if they have grooves. Sealants are rarely used on adults. There are however some adults whose dentition predisposes them to dental caries because their teeth have very deep fissures. Such adults could benefit from sealing. Step 3: An acidic solution is applied to the fissured area and allowed to sit for a few seconds before being rinsed off. The acidic solution roughens the surface of the tooth and this allows the sealant to attach better. 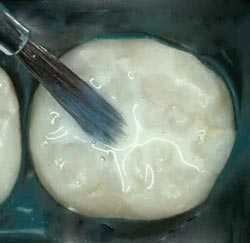 Step 4: After the dentist dries the tooth, he places liquid sealant on the fissured surface. Step 5: Using a light, the sealant is hardened. There are times when a dentist will use a sealer with a hardening component and in such a case, a hardening light will not be necessary. You can start chewing on the tooth once the sealant dries. Sealants have been used for many years and are known to last for a very long time. You can also get new sealant applications if needed. Even after you get sealants, you need to use fluoride toothpaste to protect other parts of your teeth and mouth from decay and disease.